Tulsa Officer Betty Shelby is facing manslaughter charges after she shot 40-year old Terence Crutcher dead near his car September 2016. There were calls about an abandoned car in the middle of the street. Officer Shelby was actually on route to another dispatched call when they came across Crutcher according to NY Daily News. According to reports, it was Crutcher’s car and he was having car issues. 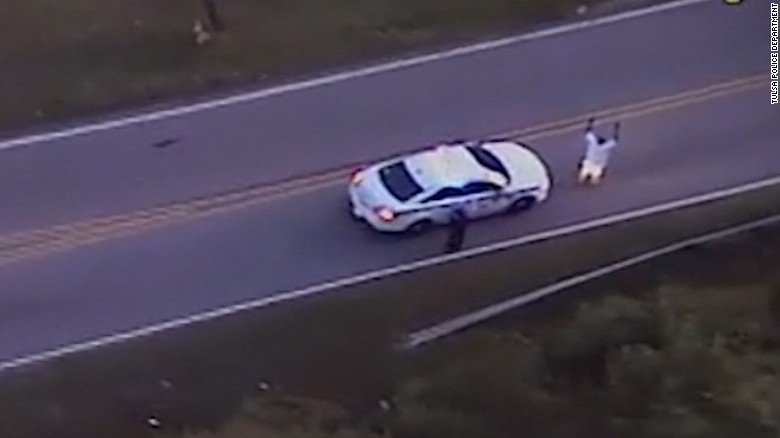 In the video, you see him walk away from the officers after approaching with his hands up. HE slowly reached in his car, first tased and then shot. Witnesses told FOX 23, “Crutcher had his hands in the air and was walking very slowly and carefully, fully aware that being in the presence of police was dangerous, when he was shot and killed”. He was unarmed. This guy’s still walking and isn’t following commands. It’s time for a taser, I think. I’ve got a feeling that’s about to happen. That looks like a bad dude, too, could be on something. Shelby said she drove past the 40-year-old Crutcher standing “zombie-like” in the roadway about 10 minutes before the shooting occurred. “And he’s standing there motionless. And I thought, ‘Hmmm. I wonder if he’s on PCP,'” Shelby told CBS journalist Bill Whitaker. In the interview, she says when he wasn’t obeying her command and looking back at his car that he trying to calculate how he an get to his car for whatever weapon even though he was not belligerent or aggressive.